This is from Jon Friedman who writes Media Web for MarketWatch. It was sent this way by Mike Kent, who formerly worked at the Star in IT and now does writing, editing and IT consulting. Thanks to Mike. "Commentary: The media world had better take notice"
"NEW YORK (MarketWatch) — Well, folks, that was a nice media comeback, wasn’t it? And it went by so quickly, too! "Just a few quarters ago, executives were trumpeting the prospects for industrywide revival. They shook off the problems that had afflicted the business — a prolonged advertising-revenue slump and a collective inability to maximize the potential of the Internet. "The bad old days are here again. "Gannett (NYSE:GCI) said it plans to cut about 700 employees as a component of an ambitious newspaper-industry cost-saving scheme. See Market Pulse item on Gannett job cuts . "Gannett said the economy is recovering at a slower pace than had been expected or certainly hoped. In other words, Gannett is warning the rest of the U.S. newspaper industry to fasten its seat belt, too. It’s going to be a bumpy ride. "The job cuts represent approximately 2% of Gannett’s workforce. The reductions will affect its 80 community newspapers — but not the flagship USA Today. "It’s significant to note that Gannett won’t tamper with USA Today. As a former USA Today reporter, I’m not surprised. USA Today occupies a big place in the Gannett corporate history. "The 'Nation’s Newspaper,' as Gannett dubbed the product, was launched in 1982 and signified Gannett’s hope to break into big-time national journalism and challenge the New York-and-Washington choke hold on readers and advertisers. "Even though the media establishment openly snickered at Gannett’s presumptuousness, USA Today caught on and found a sizable audience in relatively quick fashion. "As a result, the newspaper industry began to regard Gannett as more than a bunch of small-town hicks who had pretensions of finally being invited to the chic dinner parties on Sutton Place and in Georgetown. 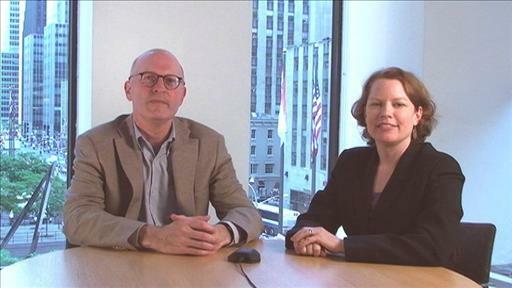 "Clare McKeen and Andrew Bary discuss how newspaper companies such as Gannett, New York Times and Washington Post deserve more credit for their valuable assets. "But here are no sacred cows anymore. The Washington Post (NYSE:WPO) peddled Newsweek to the highest bidder, ending a five-decade association with the magazine. Full story from November 2010: Newsweek to merge with Tina Brown’s Daily Beast . "Along the same vein, McGraw-Hill (NYSE:MHP) at one time regarded BusinessWeek as the face of its company, yet it dumped the magazine when losses became prohibitive and profit prospects looked bleak. See 2009 story: Bloomberg to acquire BusinessWeek magazine . "If Gannett felt compelled to make these kinds of cuts, could other citywide newspaper publishers soon be making similar gloomy announcements? "The media industry has been rendered punch drunk by now. Its ancient business model is broken. It is an industry bereft of original solutions and is left hoping against hope that the iPad (NASDAQ:AAPL) will lift all boats. "The industry has seen this movie before, God knows. Newspapers have cut staffing levels to the bone, and then some, without achieving much comfort. Now, it appears, they’re going to be at it again." A writer friend of mine from Asheville was heard grinding his teeth over cuts to the Gannett rag there. USA today as the registration, with them doing national news. Four pages of content, including local news, obits, advertiser pimps, and co-op features. One half page for editorial and op-ed, and Varvel gets syndicated south of the Mason-Dixon line, while Doonesbury is forbidden in that area. Free hotel and airport syndicated distribution, and if that's not good enough well, go online, turkey. I think you are right-on. I believe there were even prototypes for the model you describe in the Star newsroom a year or so ago; definitely moving that direction. They are counting on Matt Tully and Erika Smith, as well as Kravitz of course, to provide the local color commentary; the rest will be pretty much what you say. I'm sure there will be some enterprise pieces, because there are still good people there...but producing those with a reduced staff will be increasingly difficult. Like TTT, I find the Sunday paper increasingly a huge joke. It is somebody's (in marketing?) idea of what a newspaper should be, rather than an effort to report real news and analyze stories, etc. You got it, Hendy. Doom and gloom....but what the hell, Archie, what the hell! If they're counting on Tully, they'd better re-educate him on a 40-hour week. And shoe-leather sourcing. Ed Ziegner's soul weeps. Ditto Ben Cole's. And Ed Ziegner's. I could go on. A national USAToday-type edition, with local color, wold, be an improvement over recent Star editions. And again, Star editors: give up on your Business "Section." It's become a cruel joke. Pathetic.